Add historic character to your business with a commercial awning. 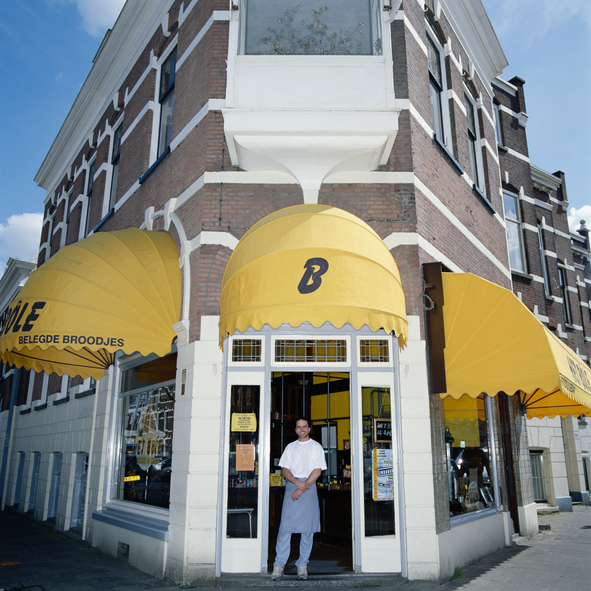 Throughout history, commercial storefronts were designed with awnings. Some were fixed wood or metal awnings; others were retractable and made of canvas or cloth. Awnings helped shelter pedestrians stuck outside in a midsummer rainstorm and also assisted in cooling down commercial buildings before air conditioning was widespread. While some historic buildings are lucky enough to have their original commercial awnings still in place, many have been removed over the decades. To add some historic character to your storefront, consider installing an appropriate commercial awning! When you are choosing the right commercial awning for your business, take into account what the rest of your building looks like. When was your storefront originally built? Shed-style awnings are typically used for storefronts with rectangular openings and arched awnings are used for (you guessed it!) arched openings. Mid-20th century storefronts look great with flat metal commercial awnings installed. Unless you have historical evidence or photographs of your building with bubble, concave, or convex awnings, you shouldn’t attempt to use them as your awning style. When picking a color, make sure it compliments your building and neighboring storefronts. In order to get the historic flair you want for your commercial awning, you need to stick to tradition! Choose an awning, if possible, that uses traditional historic materials. Metal or canvas are great, durable options for your awning that provide a nod to history and keep your business cool. Avoid using non-historical materials like plastic or wood shingles. Make sure that your new commercial awning will not cover or detract any of the cool architectural features that your building already has. If your entrance is accented by columns or pilasters install your awning in the space(s) between these, instead of putting it across your entire storefront and losing one of your defining features. If you have more than one entrance to your store, don’t have a long awning over your entire storefront. Instead, put individual awnings over each opening to accent the space properly. Ready to get the perfect commercial awning for your business? Carroll Awning Company has the expertise and equipment to make and install the perfect commercial awning to give your business a cool historic flair. We can design, create, and install custom canopies and awnings all year long. For a free estimate and to get started designing your dream awning, give us a call at 1-800-999-5617 or visit us online. To see examples of our work, follow us on Facebook, Twitter, Google+, and LinkedIn.